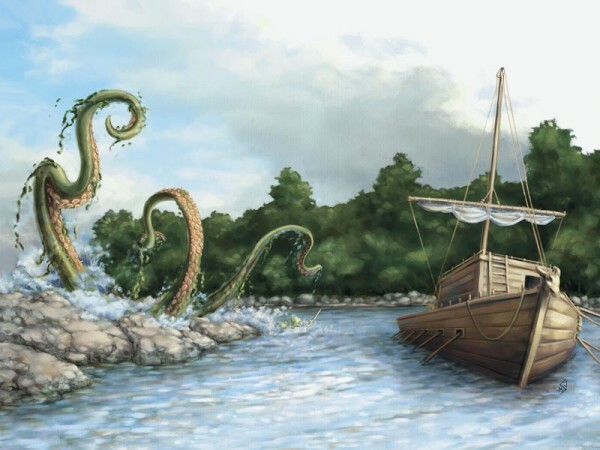 Here’s what happened in last night’s game, in which Skalmad escaped to the Feywild. Each PC gets 1,800 xp. Well rested, the PCs return to the cavern with the skeleton cages and search the hags’ lair to the east, finding ritual components, a magical torc and other treasure, as well as a few over-ripe bog pheasants. Hrothgar stuffs one of the birds into his backpack in case he fancies a snack later on. Next, Hrothgar and Juma open the door to Skalmad’s throne cavern. 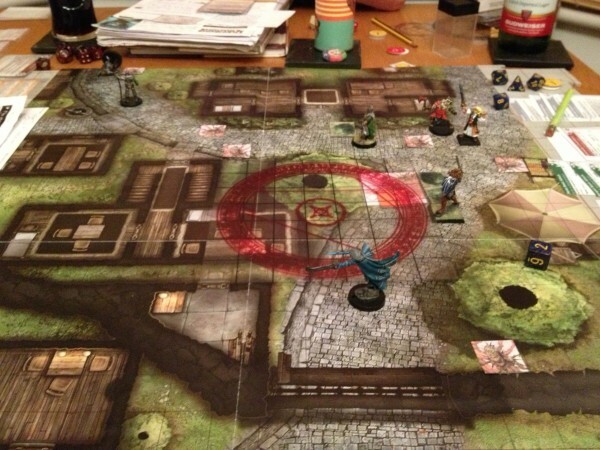 Gil casts burning transformation and everyone stays close to Sora to wait for her to cast wrath of the gods as the trolls and drow in the room advance on the party. The drow shroud themselves in clouds of darkness, making it hard to fight them, and both Juma and Hrothgar in the front rank need to be healed early in the battle by Ulthar and his flashing armour. Once Sora has cast her spell, the PCs are able to move further into the room. 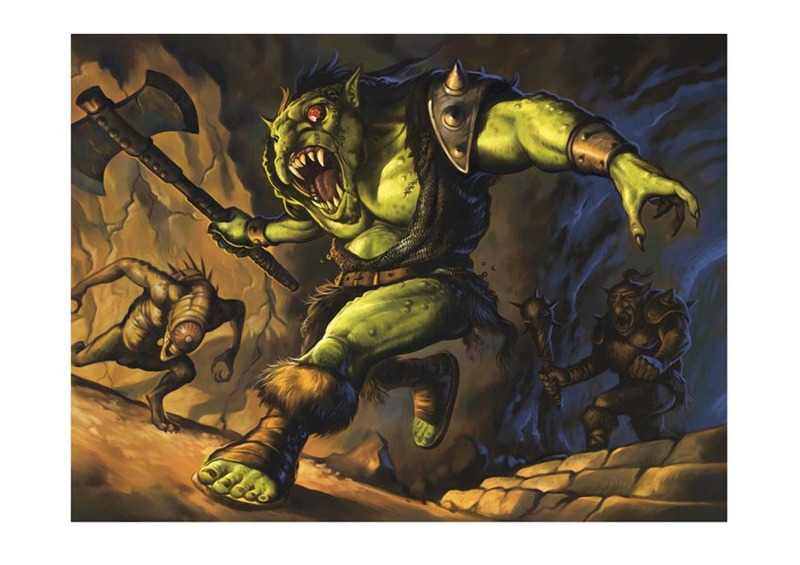 They concentrate their attacks on the front two trolls, bringing them down, but are unable to keep them from regenerating until Gil finishes them off with a fire shroud. Juma transforms into his fiery manifestation, Jod, and kills the male drow, as Sora and Hrothgar attack Skalmad. The troll king burns the PCs with his smouldering eye, then starts heading back to his throne, pursued by the gnoll. Hrothgar can’t get there in time though, and Skalmad uses the throne to shift into the Feywild. 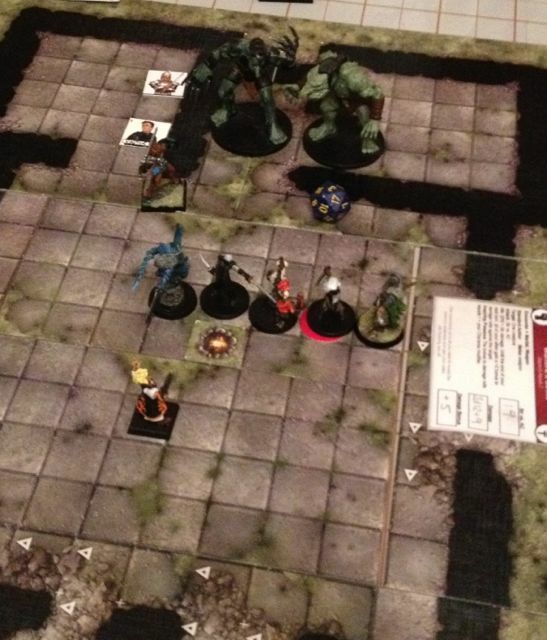 Ulthar kills the last troll and the PCs rush over to investigate the king’s disappearance. It takes them some time to figure out how the throne works but Jod is able to activate it by casting hellish rebuke (a fire spell) at Gil while sitting on the throne and concentrating on opening the portal as the other PCs hold onto the crystal seat. The surroundings change and the PCs find themselves back in the Feywild in an area open to the sky that nevertheless resembles the throne cavern. Heading north across the stream to the equivalent of the skeleton cage cavern, the PCs spot three suits of plate armour standing with great swords held up in salute. To the east is an archway blocked with a stone slab carved with glowing yellow runes in Rellenic. When Hrothgar moves to go down the steps, one of the suits of armour animates. 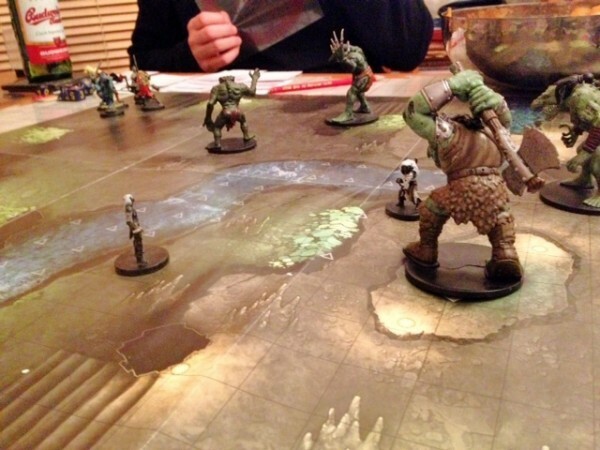 The PCs attack the helmed horror while Gil uses his float spell to drift down to the stone arch and study the runes. Realising that eladrin blood is needed to open the portal and that living blood is more potent than that of the dead eladrin lying in front of the door, the wizard cuts himself and starts tracing patterns in his blood on the slab. Meanwhile, the rest of the party drops the helmed horror, only for it to reanimate and resume attacking, along with its two companions. The PCs are taking a fair bit of damage from the horror’s elemental greatswords, but eventually Gil opens the portal with help from Hrothgar and the constructs stop attacking. The PCs pass through the cliff and arrive at the ruined Fortress of Mross-Kagg. To the north is an outpost which guards the road leading to the fortress, to the south there is a great rift in the ground, and straight ahead (east), there is a smashed statue of a fomorian. Investigating this, the PCs find an enormous gemstone which served as its larger eye. They discuss what to do next. Here’s what happened in this afternoon’s game. Each PC gets 1,308 xp. The three lights bobbing about in the dusk are indeed will-o’-the-wisps and they attack as soon as the PCs approach along the path through the bogs. Annoyingly, they wink out after attacking and prove difficult to pinpoint. 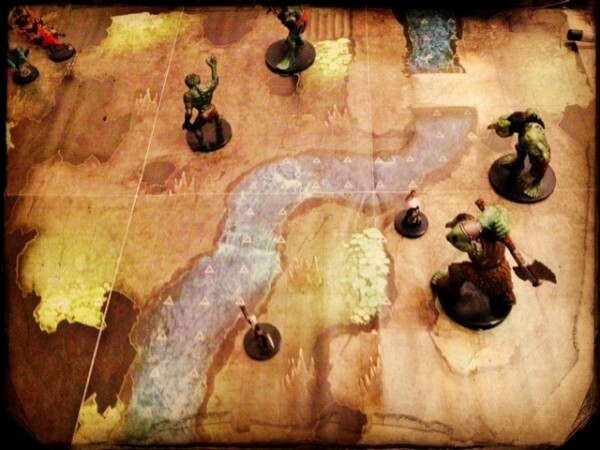 As the party separate to tackle them, three chuuls appear from out of the waters of the swamp. Ulthar slays two of the lobster-like monsters with his trusty frost brand axe and the PCs get to witness Juma Ji’ad’s brand new wind manifestation as he flies over the battlefield. With all the chuuls dead, the two surviving wisps flee into the gloom. 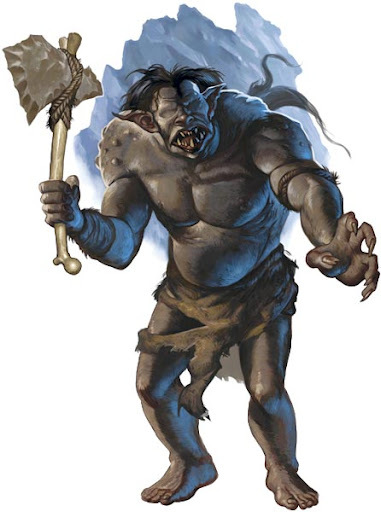 There is some discussion about carrying on to the Trollhaunt Warrens in the dark but Bax points out this might be a bit dangerous, with a high chance of blundering into quicksand or something worse. The party decide to camp for the night after Hrothgar finds a safe, solid piece of ground. There is a disturbance when Sora is on watch and hears a splash but whatever caused it has vanished by the time she goes to investigate with Bax and Gil. The PCs arrive at an ancient road with a standing stone, having used the map of unseen lands to guide their way. Gil casts a Comprehend Languages ritual (now that he has found his lost ritual book again) and translates the inscription which dates back to King Vard of Vardar. Beyond lies the entrance to the Great Warren. Hrothgar’s attempt at a stealthy approach is compromised by the not-so-quiet Juma who follows after him, tripping over his own feet and cursing. 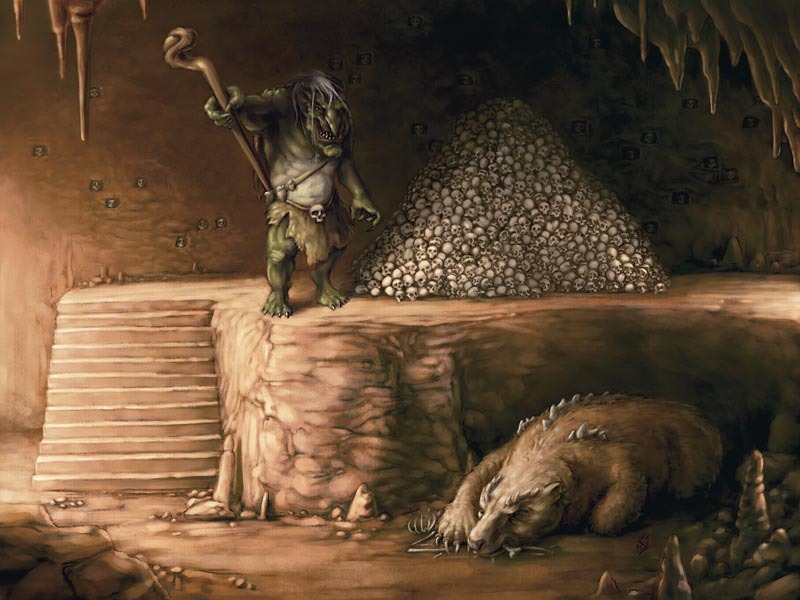 As the gnoll nears the gate to the cave, he is hailed by the trolls inside who tell him and Juma to go away. Hrothgar shouts back that the PCs are here to give King Skalmad some vital information about Moonstair but those inside don’t believe him and refuse to open the gate. The other party members approach and make several attempts to break down the doors after diplomacy fails. Eventually Juma unscrews the hinges and the gate collapses when Sora shoves it. Meanwhile Hrothgar has quietly entered the complex via the stream. Inside are three trolls and three Marrowmaw troglodytes who attack the PCs. Gil’s fire magic is once again very effective against the troll’s and even Juma’s dwarf wall of fire plays a vital role in stopping the giant humanoids from regenerating. When the trolls are killed, two of the trogs make a run for it; the third is flanked by Juma and Bax and can’t escape. Sora (flying), Hrothgar and Ulthar give chase, taking one of the reptilian humanoids down on the other side of the log bridge across the stream, but the second runs further into the complex. 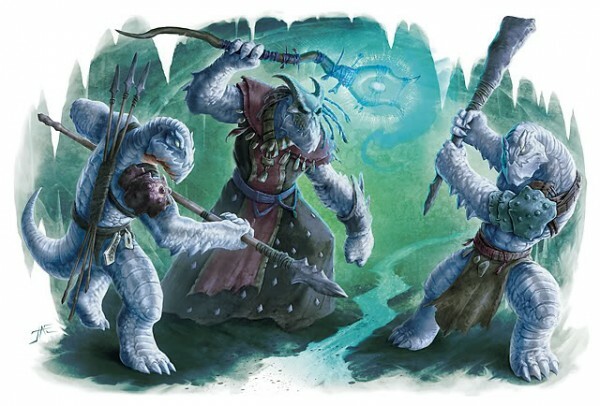 The PCs continue their pursuit, charging into the living chambers of the Marrowmaw tribe where three maulers and the shaman Kasszt join the battle. The fight is a tense one in the narrow corridors of the warrens, with Sora saving Juma from the poison rays of Kasszt and Hrothgar finally finishing off the shaman by cleaving his skull in twain. The PCs are victorious but decide to withdraw back to the entrance for a short rest. 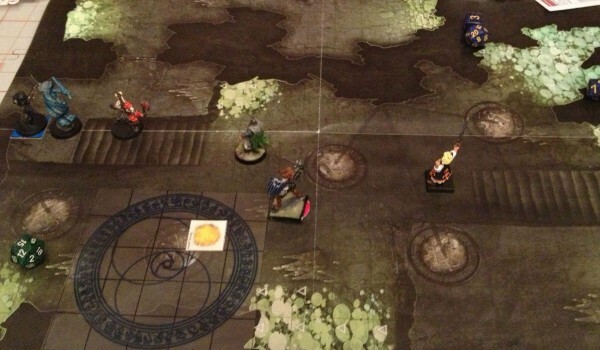 Here's what happened in last night's game, which marked the conclusion to The Lost Mines of Karak. I needed to make it more challenging for these last two encounters and think it ended up being just about right. Each PC gets 1,320 xp. After studying the three tunnels leading out from the mine entrance, the PCs take the third passage which shows signs of recent use. Caverns the party pass through show signs of recent mining activity, though on a much smaller scale that the dwarves' operations of old. Here and there, dwarf skeletons are strewn across the rocky ground, rusted weapons lying nearby. The dwarves of Karak appear to have slain each other in the end. Many of these skeletons are missing their skulls. 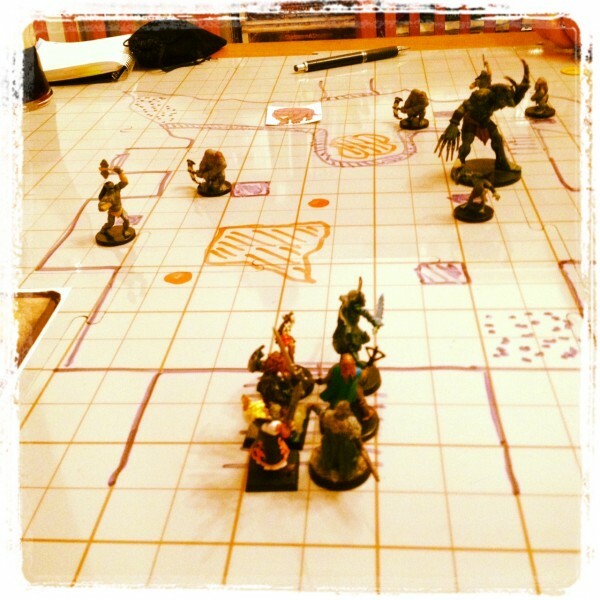 The PCs come to a vast cavern with a vein of strange red-glowing stone running across the floor of the chamber. Hrothgar leaps over the vein so he can see further into the room. As the others advance, two undead dwarf mines stagger to their feet to attack, joined by a swarm of tomb spiders. 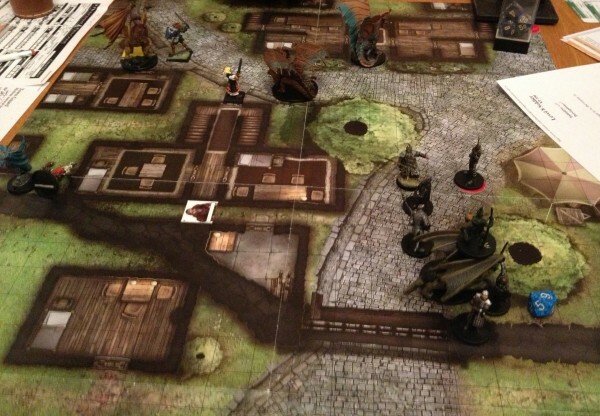 Shortly after that, a barlgura demon appears and two crag drakes burst from beneath the stone floor to ambush the party who find themselves surrounded. It's a long, tough fight with Juma and Hrothgar facing the spiders, one miner and one crag drake, while the remaining monsters attack the three PCs on the other side of the glowing red seam. The barlgura and miners try to stand on the vein of stone whenever they can as this gives them increased power. Both the miners and the spiders have attacks that can immobilise the party, making it hard for them to move around. Juma Ji'ad employs his mighty dwarf wall of fire while Hrothgar manages to strike his crag drake even after its melded into the floor. Sora makes the first kill - one of the miners - as Ulthar uses his cloak of the shadowform to go insubstantial and keep the barlgura occupied. Juma teleports around but runs into trouble after the demon is bloodied. The genasi had been laughing at the barlgura's unimpressive attacks but the smile is wiped off his face when the demon reduces him to 3 hp with a double attack. Finally, Ulthar kills the barlgura and the battle is over. 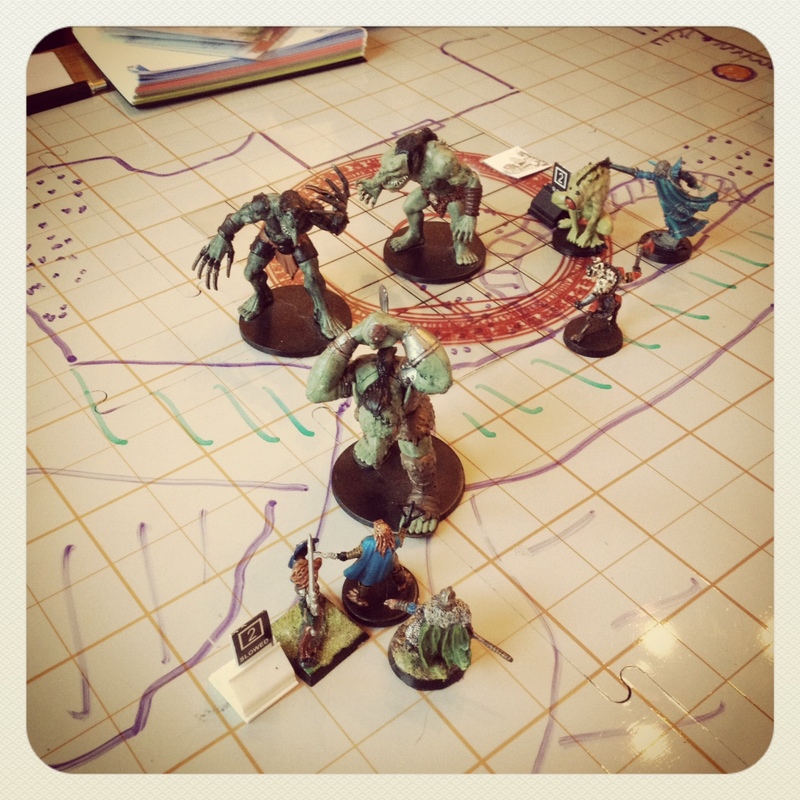 One of the crag drakes is still lurking around somewhere so the PCs keep their eyes open while Ulthar heals the party. With Hrothgar and Sora down to just two healing surges, the PCs continue on. Ahead is a circular cavern with a wide crevice that pulses with a lurid red glow blocking the way forward. Two four-armed mezzodemons stand on the far side. Behind them is Queen Shephatiah, a naga, coiled on a bed of hundreds of dwarven skulls. Gil is first to act, casting his new phantasmal killer spell at the Queen. Unfortunately it doesn't do much. Hrothgar leaps the rifts but gets skewered by the mezzodemon's trident before he can get up close and personal with his greataxe. The naga blasts the PCs with thunderstrike, dazing Ulthar who fails three successive saving throws to shake off the effect. Gil stands too close to the rift and also gets impaled by a mezzodemon's trident. Just when things can't get any worse, two firelasher elementals appear from the rift and nearly knock Gil, Sora and Juma into it! Luckily, all three PCs manage to stop themselves falling in. The PCs all get themselves over to the other side of the rift. By this stage Sora is down to no surges and Hrothgar runs out soon afterwards. Gil is teleporting back and forth, still on his hands and knees. He doesn't get up, and spends the rest of the battle crawling around, pinging opponents with magic missile (all he has left). Ulthar kills the first mezzodemon. Sora uses knightly intercession to put herself in the way of the firelasher attacking the wizard, then kills with a commander's strike from Ulthar. While the other PCs battle the surviving mezzodemon, Juma Ji'ad bravely takes on the Queen single-handed. Unfortunately, she appears resistant to his dwarf wall of fire and blasts him with two words of pain for 50 hp damage for presuming to attack her. Gil's magic missile finishes off the demon, freeing Hrothgar up to join the genasi. The naga uses her tail slap to push the gnoll back but he charges in. Eventually a commander's strike from Ulthar allows the barbarian to finish her off. 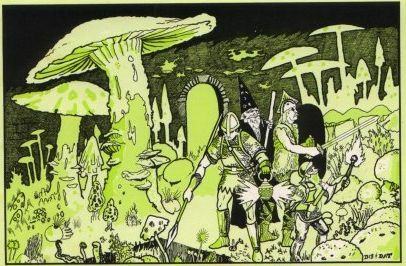 Exhausted and down to at-will powers, the PCs are nonetheless well enough to look for treasure, finding gold and three unusual items - a primordial ring, an elixir of flying and a treeform box. Several pieces of parchment reveal that the Queen had reopened the mines under orders from the Bey of the Amethyst Labyrinth. The party take a well-earned rest. A thorough examination of the remaining tunnels and caverns reveals nothing further of interest. Here’s what happened in last night’s game, featuring new much easier-to-hit Juma Lite. Four encounters in the session means each PC gets a whopping 1,615 xp – enough to reach 10th level. Hrothgar leads the way down the stairs. The “gleaming belt” wrapped round the waist of the rusty iron statue turns out to be an iron cobra which attacks the gnoll with poison the mind, dazing him, while two longtooth shifters fire arrows from below. Ulthar kills the construct with a critical hit and everyone piles in on the two shifters – Hrothgar delivers the killing blow to the first one, then immediately charges and kills the second. 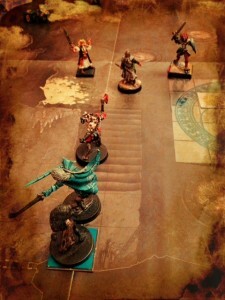 The battle over, the PCs head into the catacombs beneath the fortress. The first room they come to is a prison block containing four cells – birdsong can be heard coming from one of them. Ulthar runs past Hrothgar and opens the cell holding an old man dressed in peasant clothes and accompanied by seven chirping canaries. He offers the old man first water and then food which he smilingly accepts but he remains silent, despite the warlord’s charismatic questioning. The other PCs think the old fellow is a bit simple and let him pass to go upstairs. Next, the party search two old, dusty storerooms. Gil finds hunk of rock containing a thin vein of silver – is this evidence of the Karak Lode? Little else of value is discovered. Finally, the PCs enter the crypts where the dwarves of Clan Ironfell have been interred. As Hrothgar rounds the corner into the hallway, lined on both sides with vaults, one of the many doors springs open and a berbalang appears, immediately summoning two duplicates of itself. The monster is frustrating to fight as it deflects damage on to its duplicates (including a critical from Hrothgar), absorbs one of the them to heal itself, and then blows one up in an explosion of psychic gore which catches Juma, Sora and the gnoll. In the tight confines of the corridor, Gil’s flaming sphere is also something of a hindrance, burning the other PCs nearly as much as the berbalang. Eventually, though, the creature is cornered at the far end of the corridor and slain. With nowhere obvious to go, the PCs spend an hour or so searching for secret doors in the dungeons without success before heading back upstairs. The sandstorm has arrived and waiting it out seems to be the only option so the PCs head for the ore storage room to rest. Yellow feathers and footprints in the sand seem to indicate that the “bird-man” headed out into the storm. Returning to the courtyard in the centre of the fortress to see if the sandstorm is over, the PCs are ambushed by a group of chokers, led by a troglodyte curse chanter. Sora is grabbed by a choker and strangled – when Juma swings at her assailant, the blow strikes the dragonborn instead! The troglodyte puts a nasty cavern curse on Hrothgar who has also been grabbed. Ulthar kills the first choker, then moves up to attack the reptilian priest who is shooting weakening poison rays at the party’s warriors. 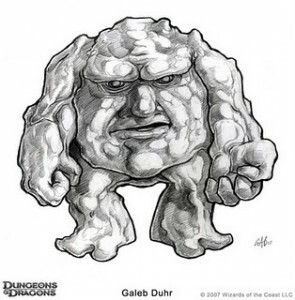 Hrothgar has now disposed of his assailant and charges the chanter, leaving Sora, Juma and Gil finish off the last two aberrations with help from Ulthar. The paladin moves in on the curse chanter and delivers a near-fatal blow – the flames from Gil’s sphere finish the trog off. Victorious, the PCs retrieve a signet ring of Clan Ironfell from the body of the troglodyte. Yellow canary feathers lead out of the room. When followed, these take the party downstairs to the cells where the bird-man was locked up. In one of the cells a large round hole has appeared in the floor. Beneath is a platform operated by a pulley system. Hrothgar and Juma go down, followed by the others. The chamber below is clearly the entrance to a mine – the PCs have at last found the Karak Lode! Ahead is a portcullis and beyond are two troglodytes. Hrothgar and Juma move forward, only to be shot at by a poisoned dart trap. Sora tries to lift the portcullis but fails; fortunately Ulthar succeeds and the PCs are able to move up and attack the guards. More troglodytes arrive from a side chamber and others can be seen in the strangely-glowing cavern at the end of the corridor. Gil’s fireball softens up the enemy and the brave wizard follows this up moving in and casting fire shroud. Even Juma’s “dwarf wall of fire” proves effective and it doesn’t take long before the foul-smelling humanoids lie dead. Studying the glowing dark red veins twisting through the otherwise grey walls, Gil thinks energy from the Elemental Chaos has somehow leached into the mines…..